Just announced via the SEGA Blog, this limited edition version of the game will be available to those who pre-order in North America while stocks last. 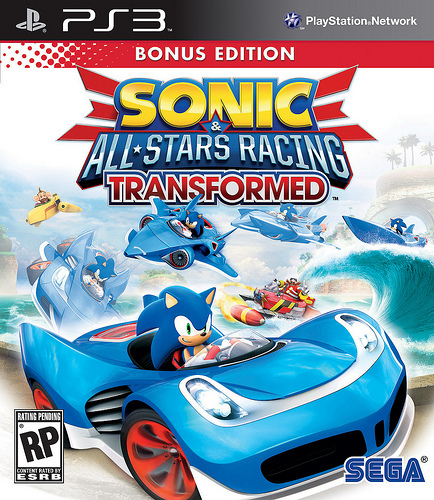 In addition to bragging rights and a slightly altered box art, the incentives for getting this version are the OutRun Bay track in which “the whole race is transformed as you get to speed across the gorgeous shimmering blue ocean as well as the roads”, as well as a playable appearance from the Sonic villain of the moment, Metal Sonic. Fresh from his starring role in Sonic 4: Episode 2, he’s back to take on the blue blur once more, this time on the race track! And the air! And the sea! And as if that’s not enough, the Bonus Edition will also contain an Emoticon Sticker Pack, which you have to collect throughout the game “as rewards for skilful play, high scores and more”. As it stands, the Bonus Edition appears to only be available for the Xbox 360, PlayStation 3 and PlayStation Vita, with no mention of the Wii U or 3DS versions at all. Also, fear not if you’re not a North American resident, as a Limited Edition of Sonic & All-Stars Racing is planned for Europe as well – but the specific details of which are yet to be revealed. Will it be the same as this Bonus Edition, or will it be different? Stay tuned to TSS for all the latest as and when it’s announced! What do you think of this news? Are any of you now planning to get the Bonus Edition? Let us know in the comments! Darn, I can’t wait to hear about the European version! All of my rings…TAKE THEM! If there’s a bonus version for the 3DS, I’m sold. Can’t wait to hear more news on this. Hopefully the EU version will contain at least Metal Sonic or the new track, I was disappointed that very few people enabled the DLC online when playing the first game meaning that buying him was a waste of money if I didn’t have people to play 2p+ with. My major concern is that hopefully this time SUMO will allow him to be used by people who bought him and still able to be played alongside people who haven’t. As for the Transformable Out-run Track I certainly don’t want to miss a gem like I know it’s going to be. Where is silver the hedgehog ?!!!!!!!!!!!!! No Wii U version? No thanks. When was it confirmed that there WASN’T a Wii U version of the Bonus Edition? The console hasn’t even got a release date yet. Ignore them,there just your typical internet dumbass. The correct form is “they’re” a contraction of “they” and “are”. This game should be a Holiday hit. I’ll get the Xbox bonus edition for when I’m with freinds and the 3DS version for when I’m on the go. Maybe SEGA is holding back for a Nintendo exclusive announcement for Wii U and 3DS? Please be Mario! Please be Mario! Please be Mario! Those Bonus Editions, is it available for retailers like Gamestop, or ONLY from the SEGA Blog site (I have not clicked on the link yet)? Well, Mario was a beta for Wii in the Sega Sonic All-Stars Racing at a point… so maybe!! Please not Mario! Please not Mario! Please not Mario! Instant pre-order when the European version comes about! Errr, I just hope the Wii U version will get something. Sigh…and the pre-order madness continue. Oh well, at least it’s not DLC, though would probably sneak that in anyways. Cool! Awesome! I can’t wait to race along the seaside with metal sonic. I just hope the PC version gets all this stuff. There’s still a PC version, right? And thus my pre-order was lost. Seriously, i was planing on getting this first day, but because those who dont pre-order for whatever reason( lack of funds, on the fence, game may end up sucking so wait for reveiws) get jipped of content that could easily implemented ( im willing to bet it already has but was then removed) and sounds like it was made during the games development, I have lost all interest in this. Didn’t Amazon list a bonus 3DS edition? I would pass it up….but my loyalty to Metal Sonic prevents me from doing such. TO GAMESTOP! Sure hope that stuff becomes DLC after it comes out. Otherwise, I won’t be able to get it. Sounds interesting…hoping Australia gets it. I actually like this idea, a SE that contains hidden goodies worth pursuing. Curious how many more might be included that haven’t been mentioned yet. I wonder what the remixes will sound like. And what will Metal Sonic’s theme be! ?